Want to Make Your Library the Go-to Place for Playtime? Here's How! Want to Make Your Library the Go-to Place for Playtime? Here's How! La Crosse Public Library’s Play and Learn area has become the go-to spot for caregivers and their children during visits to the library. While a few children play with a Make Your Own Potato Head flannel board, most of the action is at the Farmer’s Market stand. Little ones take turns shopping and checking out on the play cash register, showing their fruit and vegetable purchases to their caregivers. The children and their caregivers haggle over prices, discuss what the small purple vegetable is called and develop early literacy skills in a natural way. 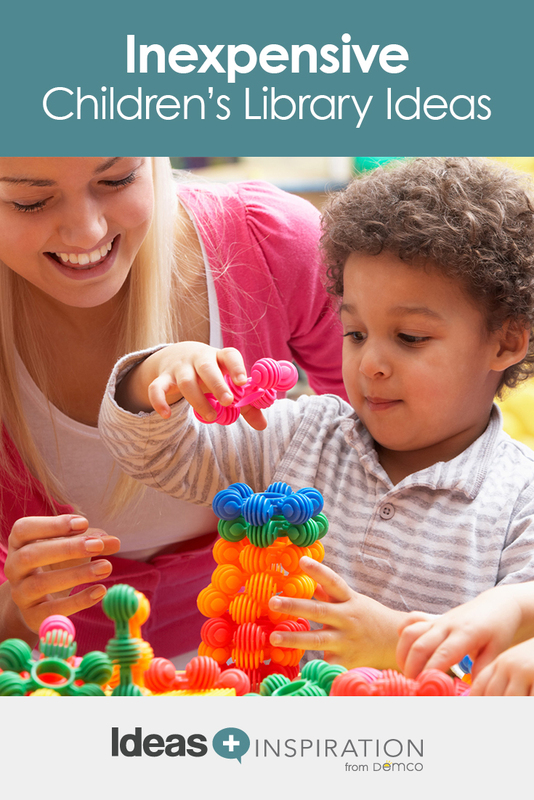 With an evolving collection of play furniture, toys and manipulatives, the Play and Learn space combines learning and fun to promote early literacy. 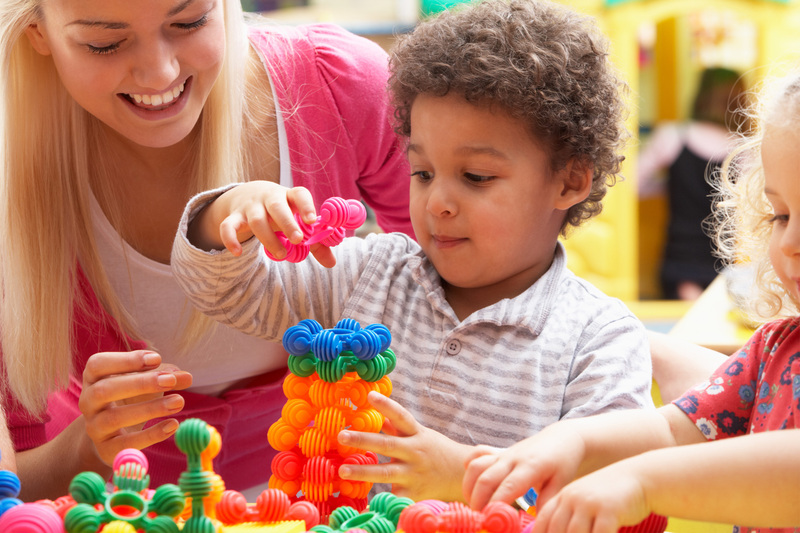 Play is a vital way to build a variety of early literacy skills. Play contributes to the development of cognitive and physical skills, as well as to the emotional well-being of young children (Ginsburg, 2007). While educators and librarians agree that play is beneficial for children, implementing it can seem challenging at first. Is there space for toys and props? What is the cost? How can you incorporate more toys and props into storytime? Not all libraries can carve out a dedicated space for play. The great thing about play, though, is that it can be as complex or as simple as your space and budget can afford. If space is limited, you could add flannel or magnetic boards to end caps. Matching games and flannel stories are sure to please young patrons. Consider changing activities monthly to keep toys fresh and exciting. You can also use floor space to incorporate early literacy skill building. Placing numbers on the floor for children to hop on or step on builds gross motor skills and number awareness. You can outline basic shapes like squares and triangles on the floor as a way to build letter awareness. Learning letters is easier for children when they know their shapes first (Wood, 2001). Convert existing furniture into early literacy activity centers. Cover a table with bulletin board paper for children to scribble on (builds hand muscles and fine motor skills) or tape pictures of different objects onto the table to create your own seek and find (increases caregiver and child interaction). Tight library budgets make cost an issue for any new undertaking. However, much like space, the cost of playing at your library can be as much or as little as you need it to be. Play furniture pieces are a great way to provide a focal point for playing in your library. Puppet stages, produce stands, dress-up stations and activity wall panels are all well worth the investment if your library can afford it. Even on a small budget, there are still a multitude of options. Ask your local furniture or appliance store to donate oversized boxes; cover the boxes with paper to turn them into rocket ships or cars. Hang up a metal baking sheet and cover it with magnetic numbers and letters. If you’re feeling really creative, you can create a magnetic storytelling center. For example, add a palm tree to the metal baking sheet for a magnetic version of Chicka Chicka Boom Boom by Bill Martin Jr.
One easy way to increase literacy play in your library space is to leave prompts throughout the room. Signs with open-ended questions for caregivers help guide and increase play interaction with children (Morrow & Rand, 1991). Simple conversation prompts, such as “Ask your child about the colors they see” or “Talk to your child about what supplies you might need on the moon,” are a great way to increase children’s vocabulary and knowledge of the world around them. Including toys and props in storytime is a natural way to engage young children in early literacy skills. Introduce shaker eggs during the song “I Know a Chicken” by Laurie Berkner; you will have both caregivers and their little ones laughing. Shaking eggs to simple nursery rhymes like “Twinkle Twinkle, Little Star” or “Baa, Baa, Black Sheep” provides a simple way to talk about syllables and phonological awareness with caregivers; these are key skills for young children to develop (Moats and Tolman, 2009). A parachute is another great prop to incorporate in storytimes. Having young children grasp the parachute builds fine motor skills by using hand muscles. Parachute play also develops gross motor skills by engaging children’s balance and core muscles. During parachute play, you can sing standard storytime songs, such as “Itsy-Bitsy Spider” and “Five Little Monkeys.” Adding small, soft props on the parachute, such as scarves or puppets, makes play even more entertaining! 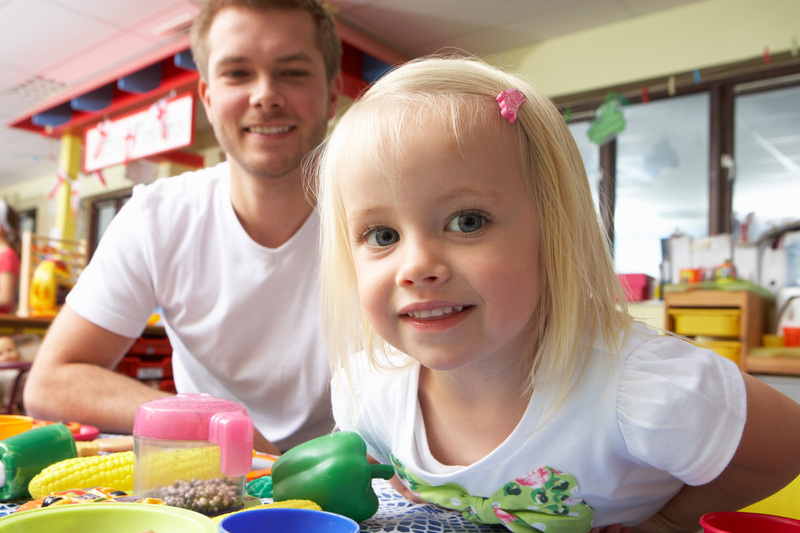 Playtime is a vital component of storytimes for children. Adding playtime at the end of storytime is an opportunity to model for caregivers what appropriate play looks like with young children. 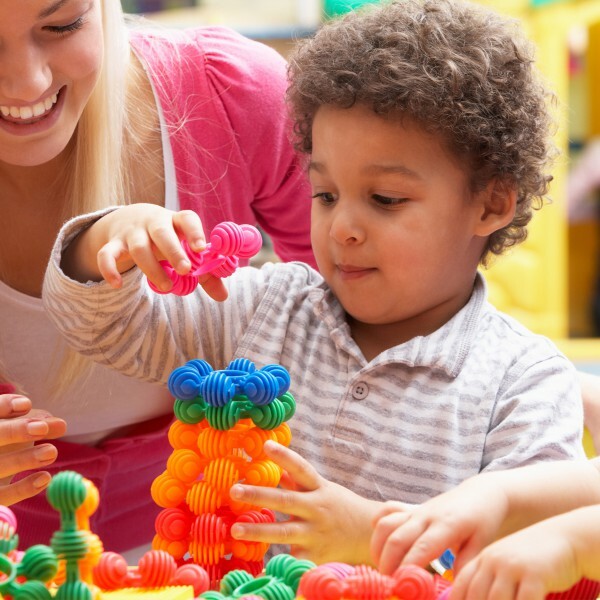 Whether you purchase toys or simply have board books, puppets and scarves available in the room, playtime increases children’s social skills and improves interactions between caregivers and their children. Learn more about Why You Should Be Promoting Playtime at Your Library. Ginsburg, K. (2007). The importance of play in promoting healthy child development and maintaining strong parent-child bonds. Pediatrics, 119(1), 182–191. Moats, L., & Tolman, C. (2009). Language Essentials for Teachers of Reading and Spelling (LETRS): The Speech Sounds of English: Phonetics, Phonology, and Phoneme Awareness (Module 2). Boston: Sopris West. Morrow, L., & Rand, M. (1991). Promoting literacy during play by designing early childhood classroom environments. The Reading Teacher, 44(6), 396–402. Wood, J., & McLemore, B. (2001). Critical components in early literacy: Knowledge of the letters of the alphabet and phonics instruction. The Florida Reading Quarterly, 38(2).